Group of People Hanging out near Campfire at Evening, Man Playing on Guitar. Shot on RED Cinema Camera in 4K (UHD). Alpha Channel: No; Looped Video: No; Frame Rate: 25; Resolution: 3840x2160; Video Encoding: Photo JPEG; File Size: 407mb; Number of Clips: 1; Total Clip(s) Length: 0:14; Source Audio: No; Color: Full Color; Setting: Outdoors; Pace: Real Time; No.of People: 5+; Gender: Male, Female; Age: Teenage, Young Adult, Middle Aged. 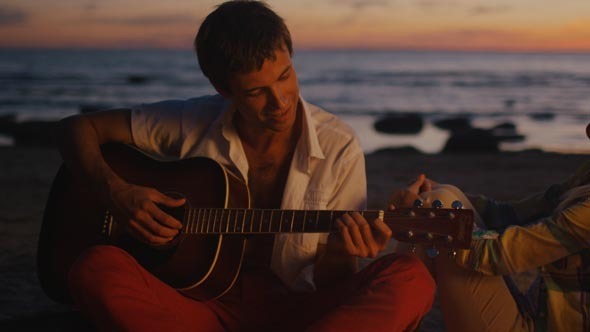 Keywords: beach, camp, campfire, evening, fire, friend, fun, guitar, hang out, holidays, nature, night, people, travel, trip.